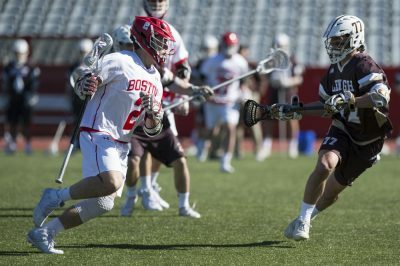 With only two Patriot League games remaining in the 2018 season, the Boston University men’s lacrosse team heads to Baltimore this weekend to face off against conference powerhouse Loyola University Maryland. The Terriers (6-6, 2-4 Patriot League) are coming off an exciting 8-7 victory over the United States Military Academy on Saturday after senior attack Ryan Hilburn scored the game-winner with 30 seconds remaining in regulation. This tally was part of Hilburn’s hat trick, which also included the game-tying goal for BU. This weekend, the Terriers will look to inch closer to the .500 mark in the conference and secure a postseason tournament berth. “I think we’re just trying to play our best lacrosse and get better week to week,” BU head coach Ryan Polley said. Polley said he noticed improvement from his team’s March 31 loss to Lehigh University, and hopes to see the strong performance continue this Saturday. Junior attack James Burr is coming off a four-goal performance against Army (5-5, 2-4 Patriot League), and the Terriers will look to him to continue his offensive dominance against the Greyhounds (8-3, 5-1 Patriot League). Burr currently leads the Terriers in goals (31) and shots on goal (53), and is second in points (41) behind freshman attack Chris Gray who has 51. Despite a crucial win last weekend, Polley said his team needs to focus on offensive efficiency, especially dodging and ground balls. Loyola has won three straight contests, and four of their last five. Junior attack Pat Spencer leads the offense with 65 points, and is averaging a conference best 5.91 points per game. Spencer is second on his team in goals with 25, but leads with 40 assists. Freshman faceoff specialist Bailey Savio and sophomore midfielder Matt Higgins have also stood out among the Greyhounds lineup. Polley highlighted Savio’s success on faceoffs, noting that the Terriers’ faceoff specialists will have quite the challenge ahead. “We’re going to try to be as physical as possible [at the faceoff X],” Polley said. Savio currently holds a .455 faceoff success percentage on the season while freshman midfielder and faceoff specialist Sean Christman leads BU with a .493 clip. Polley also mentioned the success of Higgins. The Terriers will look to repeat their previous success against Loyola, with the last matchup between the teams resulting in a 12-11 overtime victory for the Terriers on April 15, 2017. Burr scored twice in the game, including the go-ahead goal in overtime. For Polley, focusing on its own performance is pivotal for his team rather than the conference standings.